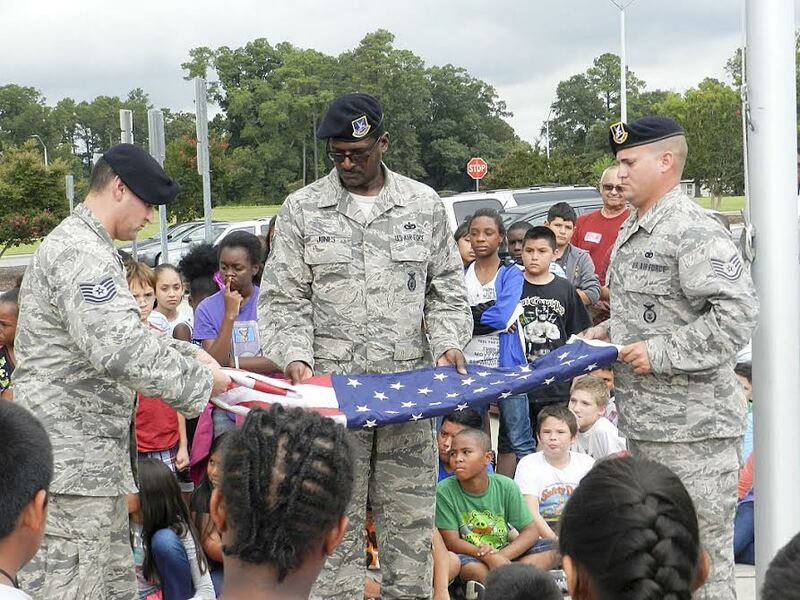 U.S. Air Force Technical Sergeants (from left) Adamo Merlo, Stephen Jones, and David Williams visit West Smithfield Elementary to talk to students about the American flag. U.S. Air Force Technical Sergeants Adamo Merlo, Stephen Jones and David Williams from the 916th Security Forces Squadron recently visited with West Smithfield Elementary School’s fourth and fifth graders. During their visit to the school the men talked about the meaning of the American flag. They taught the students how to fold the flag properly, the meaning of the stars and stripes, as well as giving the students a history lesson on why the flag is folded into a triangle. The men also talked about the history of the first flag, who is credited with sewing it, and the importance of having proper respect for the flag. After showing the students how to properly raise and lower the flag, the students were given time to ask Merlo, Jones, and Williams about their time spent in Iraq and Afghanistan.